Jaysh Thuwar Baghdad- whose name translates to “the Army of Baghdad Revolutionaries”- is by no means a group of great influence in the overall Sunni Arab insurgency in Iraq. Nonetheless, it is important to document as many groups as possible for the sake of completeness. This brand name appears to have first emerged in the summer of last year, with a series of tweets put out in support of the Sunni Arab protests; for instance, from 20 July: “Today we see how the companions of principles who have come out in demonstrations and established sit-ins against oppression and the oppressors have terrified the oppressors with their demands for their rights.” Another tweet from the same day denounced the troubles for “Iraqis” created by “the occupation and its collaborationist government.” The account further urged for the continuation and broadening of sit-ins. He then explains at length the significance of the various aspects of his group’s logo. One of the most recognizable features of it is the old Ba’athist flag, together with the artwork from the monument of Liberation Square in Baghdad, a symbol most notably used by the Naqshbandi Army (JRTN)’s activist wing Intifada Ahrar al-Iraq, which was an active participant in the Sunni Arab protests at a number of sites. 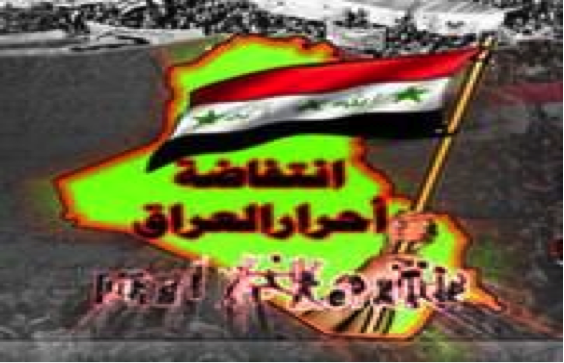 For comparison, the logo of Intifada Ahrar al-Iraq, featuring the Ba’athist flag and the Liberation Square monument’s artwork. The parallels with JRTN appeals to cross-sectarianism and denunciation of any notions of ‘division’ (contrasting e.g. with the Islamic Army of Iraq’s traditional support for a Sunni federal region) are striking. In this context, we should also note the repeated stress on the notion of intifada by al-Safi, another parallel with the JRTN in light of the latter’s activist wing. In short, there is a clear nationalist, revolutionary framework here, and talking points pretty much identical to JRTN: the rejection of notions of federalism and the superficial appeal to cross-sectarianism being most noteworthy. 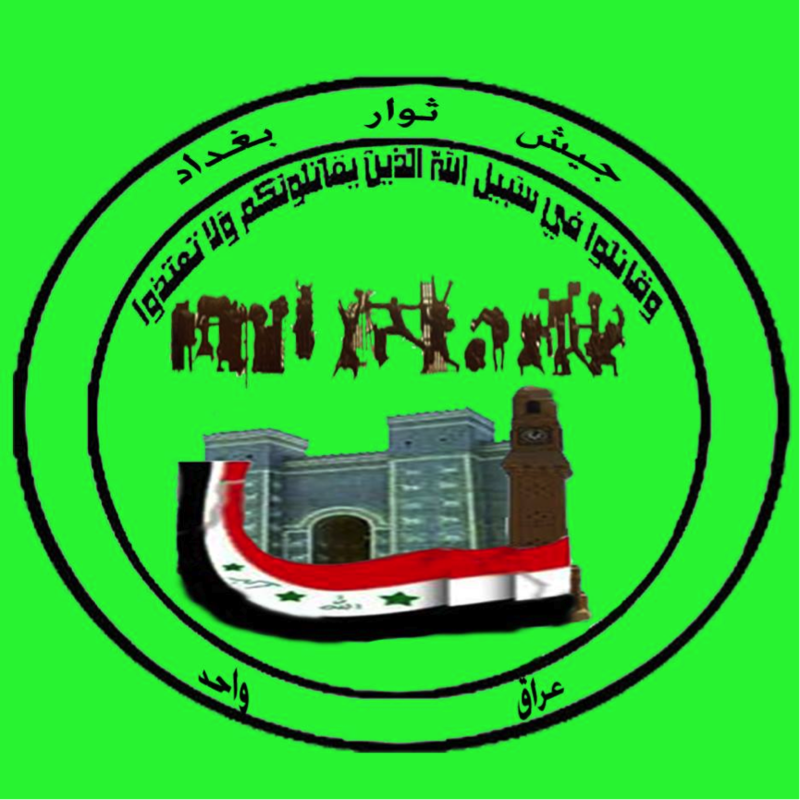 The claim of good relations with all factions parallels the JRTN too with its refusal to declare war on any faction considered to be waging war on the central government, such that IS is not mentioned by name in statements even as there is official distancing from events like IS’ displacement of Christians from Ninawa province. 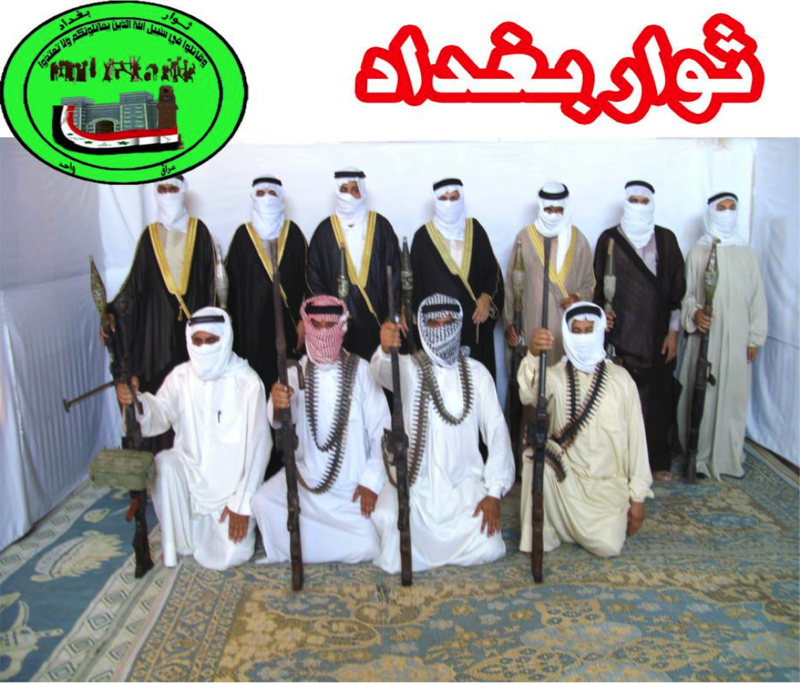 Purported members of Jaysh Thuwar Baghdad, July 2013. Commenting on a photo from the same set, a JRTN-linked Facebook account- Ahrar aliraq- wrote: “God give you victory”- illustrating the affinity between JRTN and Jaysh Thuwar Baghdad. Jaysh Thuwar Baghdad fighters. Photo put up in August 2013. 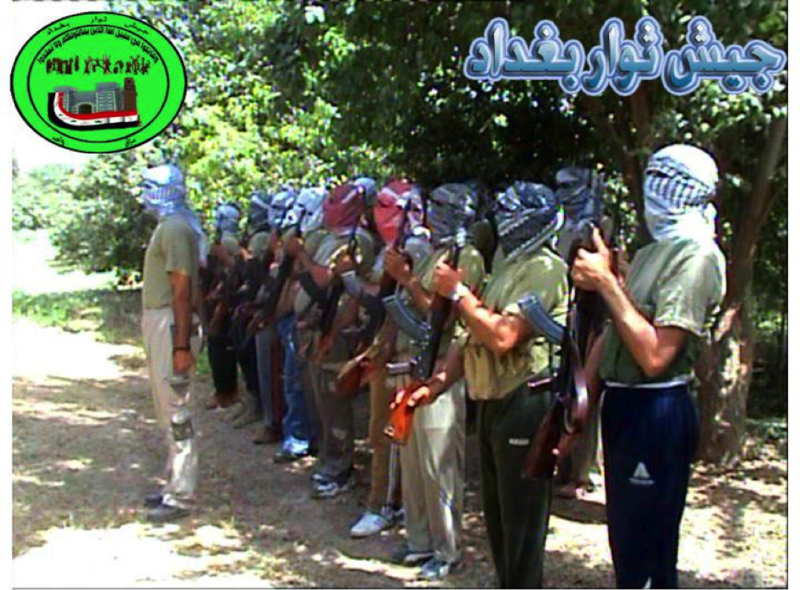 Purported training for members of Jaysh Thuwar Baghdad: released August 2013. ”Moment from one of the lessons of the anti-aircraft commandoes’ patrol”- Jaysh Thuwar Baghdad. Photo released in August 2013. Purported Jaysh Thuwar Baghdad fighters in an ambush. 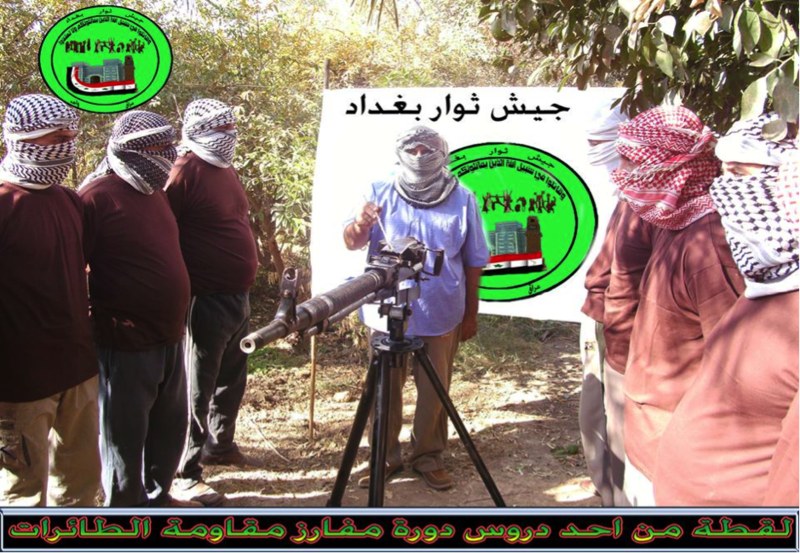 In keeping with al-Safi’s claims in summer 2013, a photo released in January 2014 claiming Jaysh Thuwar Baghdad fighters in Anbar. Supposed tribal sheikh members of Jaysh Thuwar Baghdad.
. There is nothing particularly outstanding about Jaysh Thuwar Baghdad. In terms of overall influence in the insurgency its standing seems to be on a par with Saraya al-Madina al-Munawara (i.e. a very minor faction).
. Ideologically there seems to be virtually nothing to distinguish it from the JRTN’s political rhetoric. It may not be inaccurate to view Jaysh Thuwar Baghdad as a mere front-group for JRTN.
. Despite the group’s small size, the explicit rejection of federalism by the broader JRTN/Ba’athist component of the insurgency, as well as the revolutionary aims of this component and other groups like Jaysh al-Mujahideen, has important implications when it comes to considering a ‘political solution’ to the current crisis. The fact remains that the conception of a supposed Sunni Arab majority/plurality in Iraq that should be ruling Baghdad has much currency in the renewed insurgency. The non-IS insurgents in particular may end up learning the hard way- in the face of subjugation by IS- that this is not the case.